The mats are in full grain leather with an olive flock backing. 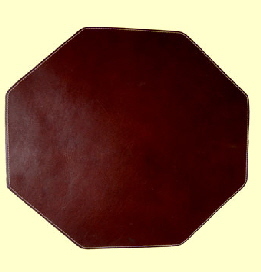 Mat shown is in Dark Burgundy leather with contrasting stitching..
We also produce large leather mats or runners to order. Our largest standard size is 406 x 654mm. In a choice of colours and with standard finish as per our other leather mats. Please note that tas hese products are made to order. we will be unable to refund or exchange if you have ordered an incorrect size or the wrong colour. items. If you are unsure of the colour you require, please contact us to discuss this as we may need to send colour swatches. The maximum delivery charged will be £9.99 per UK consignment. Payments received in excess of this will be refunded to your (PayPal) account.